In addition to other topics, I plan a return to some China tech-related themes here. For a starter, I'll share assorted excerpts of four recent pieces sans commentary by me. Much more can be found by clicking the related links. China was really just one of the last remote engineering orgs to go. Brazil gone. Indonesia gone. The centralization plan was back on target. Build in HQ – launch everywhere. Like a lot of big internet companies really. Mikko Hyponen, the chief research officer of cybersecurity firm F-Secure, said the attack was likely to have involved Chinese authorities because the hackers were able to manipulate Web traffic at a high level of China’s Internet infrastructure. It appeared to be a new type for China, he added. 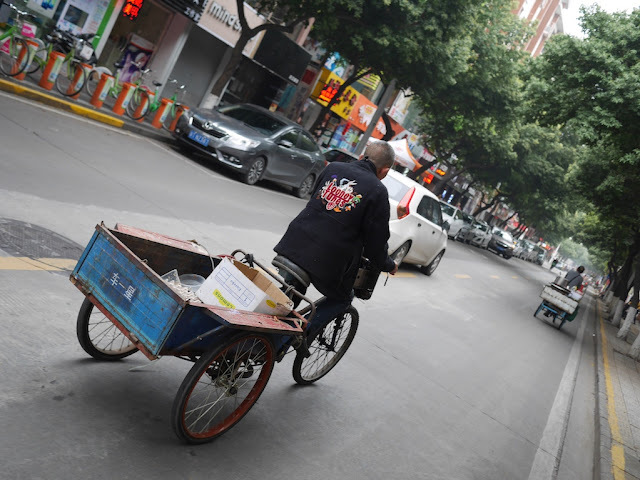 “It had to be someone who had the ability to tamper with all the Internet traffic coming into China.” he said. We have looked closer at this attack, and can conclude that China is using their active and passive network infrastructure in order to perform a man-on-the-side attack against GitHub. See our "TTL analysis" at the end of this blog post to see how we know this is a Man-on-the-side attack. 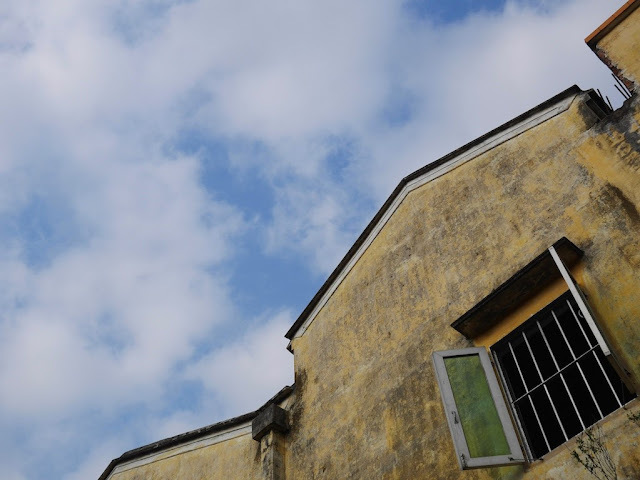 Sharing these and other photos of blue skies in Zhongshan (here and here) was partly inspired by my recent experience viewing some photos shared by friends elsewhere in the world. I doubt the deep blue skies had been intended to be the primary area of focus in their photos, and I found it striking my eyes were so drawn to them. I will move on to other topics shortly. 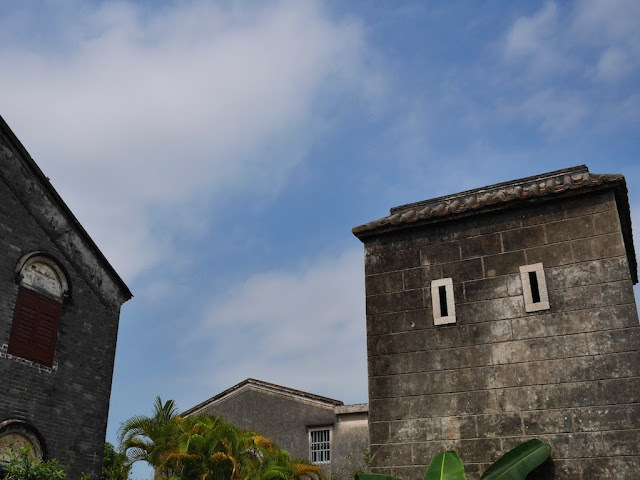 For more thoughts on how blue skies and "normal" clouds can seem unusual to me and others in China, see an earlier post with photos from Macau here. Today Zhongshan had a blueish sky. It didn't mean Zhongshan's air quality was "good", but the air was significantly better than when I was deceived by a similarly blue sky in Shanghai. It was just one of many being played at the park that day. 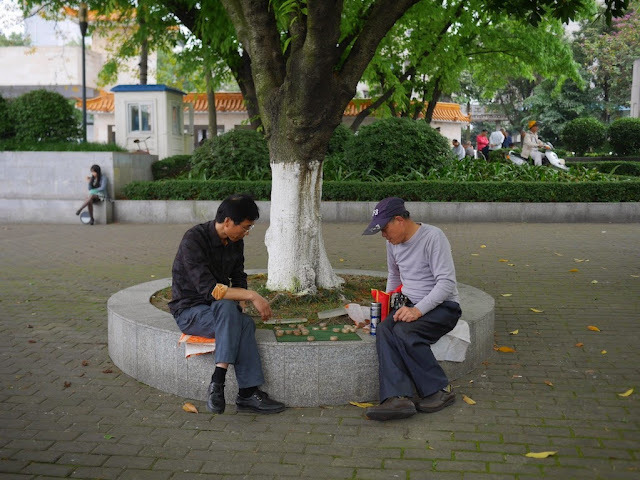 See here for all posts with scenes of people playing xiangqi, otherwise known as Chinese chess. They capture a variety of environments where the game is enjoyed. The sign is more extensive than one I saw on the Guangzhou metro a few years ago. 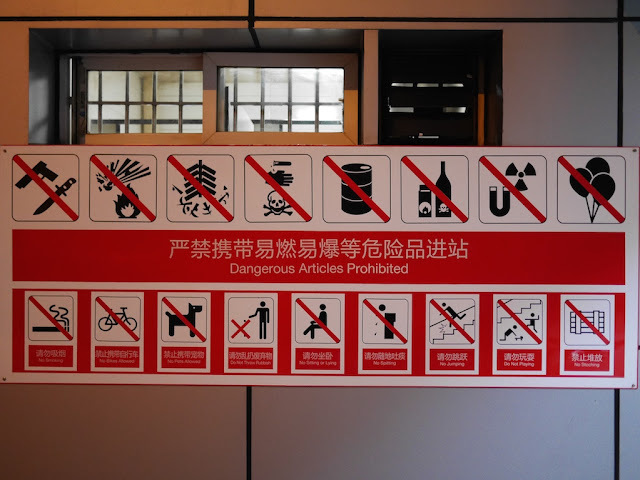 And like the Shanghai metro, balloons are forbidden and scanners at stations are used to examine bags and larger items. In Chongqing I saw one family stopped by metro security because their son had a balloon, and I felt their pain. Beats the green/red bean ice cream, but not by much. Haikou has a Baskin Robbins and I loved it at first but last time the pralines and cream was so badly freezer burned that I won't be back any time soon. A Baskin-Robbins previously opened near where I once lived in Shanghai. I never noticed many customers anytime I walked by, and it eventually closed. I assume I have tried their ice cream at their other, presumably more successful, stores in China, but I don't have any specific memories. I do remember eating green bean and red been ice cream numerous times though. I enjoy both flavors, though there is a great range in quality. One recent source I saw was unexpected: McDonald's. The above sign was at a small McDonald's outlet inside Chongqing's Niujiaotuo metro station. Unlike some other cities, eating food doesn't appear to be forbidden inside Chongqing's stations. This McDonald's is conveniently located in the path of passengers changing between two metro lines which intersect at Niujiaotuo. 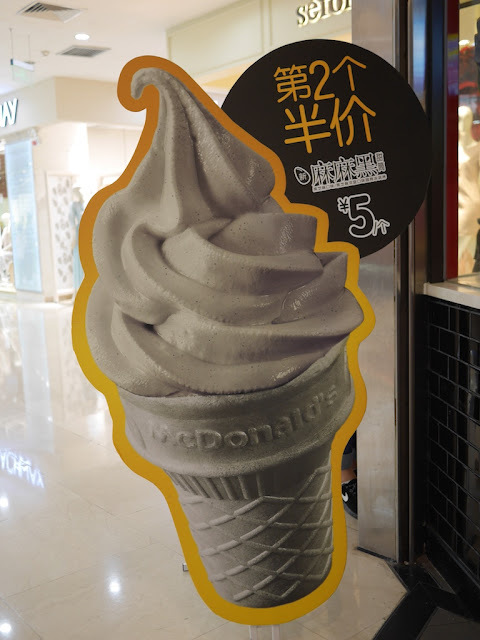 Since red bean is commonly used in deserts or pastries in China, the ice cream represents another way McDonald's has localized its menu. Not only did I enjoy it far more than McDonald's Year of Fortune and Year of Luck Burgers, I ordered it on a number of occasions. It was a great way to follow up one of Chongqing's famous spicy & numbing meals, and for 5 RMB (about U.S. $0.80) it's a reasonable deal. Although the ice cream has a distinct red bean flavor, I wasn't able to detect a noticeable flavor in the cone. A McDonald's employee explained that was because there was no added flavor, just food dye to make it green. 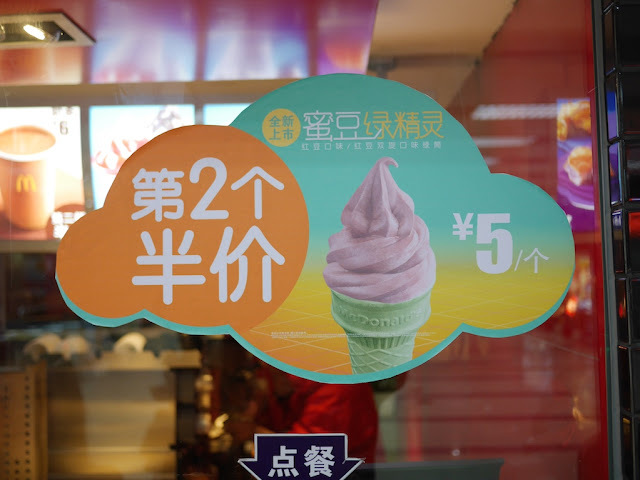 The red bean ice cream was a temporary offering which recently ended while I was in Zhongshan. Fortunately, it was replaced with another localized ice cream flavor I enjoy: black sesame seed. Like red bean, black sesame seed can be found in a number of desserts and pastries. And McDonald's wasn't the first place I have had black sesame seed ice cream. One of my favorites was at Very Thai Noodles in Taipei last year. They named it the "black volcano". My recollection is that it tasted better than the McDonald's version but had a higher price. Of all the new flavors of ice cream I have tried in Asia which are not common in the U.S., black sesame seed is probably my favorite. So I heartily recommend trying a black volcano. 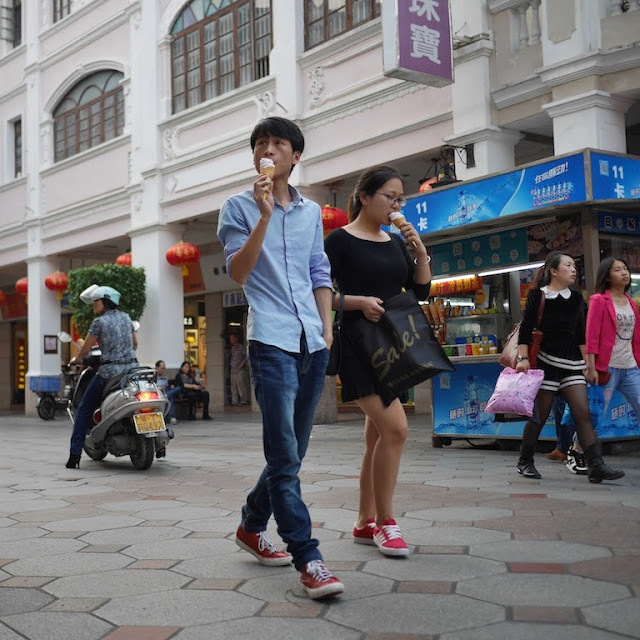 There are other flavors of ice cream more common in Asia than in the U.S. Someday I will write an ode or a post about the fruit which is another favorite flavor of mine — durian. 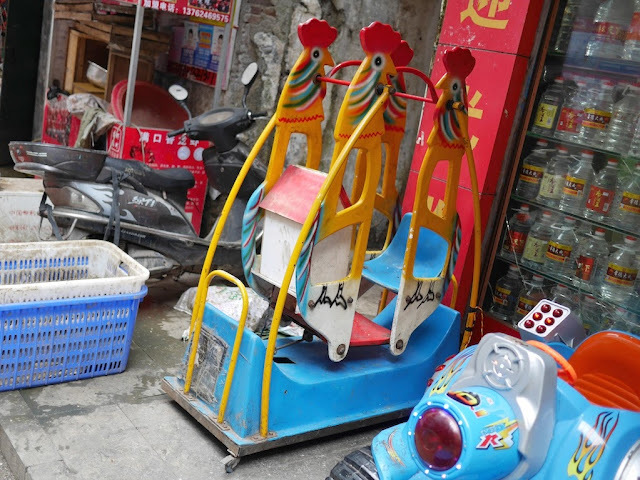 When I was in Hengyang, Hunan province, last year, two kiddie rides resembling multiple-child playground equipment made me think of China's one-child policy. It is easy to find examples of single-child rides in other countries, including the U.S., though. 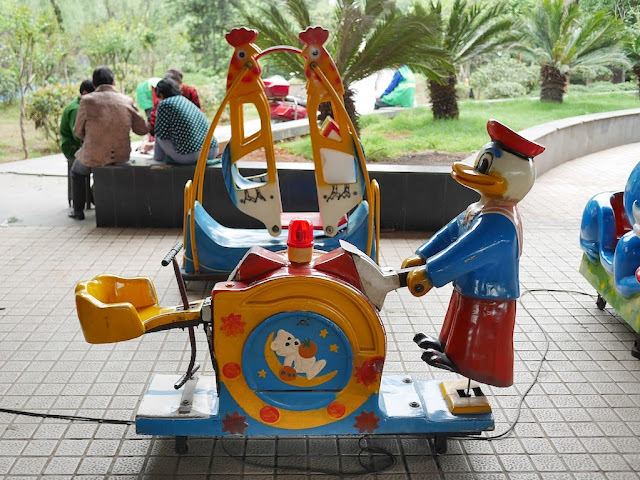 So while a certain symbolism can be seen, I wouldn't jump to any conclusions directly tying the rides to the one-child policy. Some Chinese officials have apparently extended the nation’s one-child policy to include completely imaginary virtual character in videogames, or so said a gaming-company chief executive Thursday. 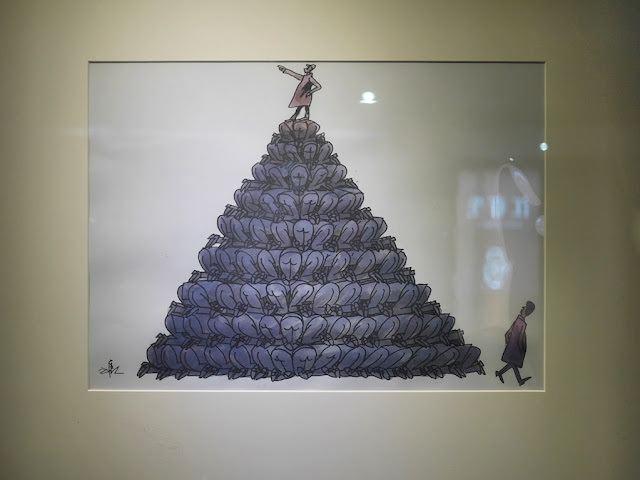 “The regulators require the birth system in our games to meet the regulations of birth-control policies, which means if players have a second child in the game, we must impose virtual social-compensation fees on them,” Xu Youzhen, CEO of Guangzhou-based Duoyi Network Technology, wrote on his official microblog account. For more about why one can't freely have multiple children or fight a giant panda in a Chinese video game, read Linda He's article on MarketWatch here. More evidence of a very immature market and uninformed consumers. I recall asking a colleague what her favorite flavor of ice cream was. Her response: milk. Before replying to the first part of Potomaker's comment, I would want to clarify what counts as a "mature market" and an "informed customer" in this case. 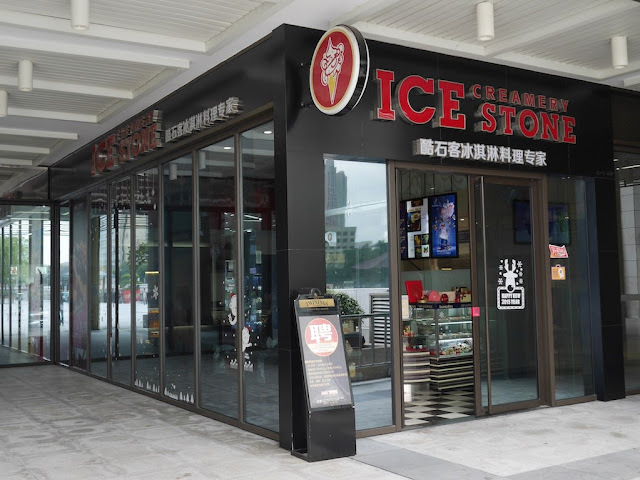 I would also want to know why customers in Zhongshan are choosing Ice Stone and more about what the store offers them, including the overall experience. 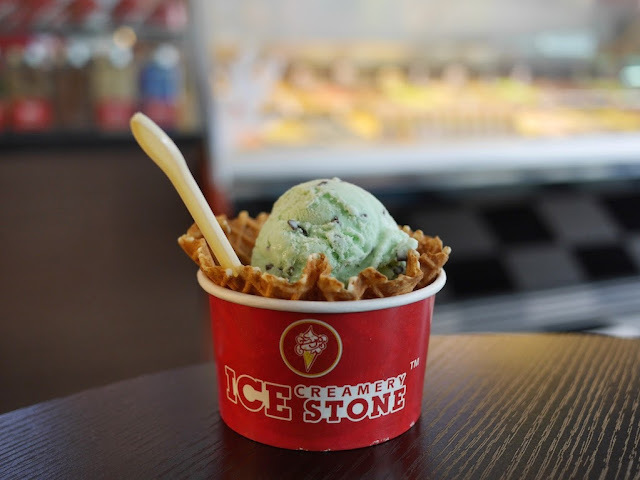 For now, I'll just say that Ice Stone's similarities to Cold Stone and my own negative impressions of their mint chip ice cream doesn't mean its customers aren't making considered decisions based on relevant information. I have more to say in response to the second part of Potomaker's comment, especially since it calls to mind some fond memories of an ice cream flavor that is likely unknown to many yet couldn't be more simple. In the U.S., ice cream I have seen for sale includes at least one flavorful ingredient, such as vanilla or chocolate, in addition to the usual standard ingredients of sugar and milk/creme. But what if someone made ice cream without any of the familiar additional flavors? And if this "flavorless" ice cream was sold at an ice cream store what should it be named? Since the flavors of this ice cream are simply milk/creme and sugar, "milk ice cream" would be a an option. It acknowledges the established use of "ice cream" as a more general term and the expectation additional words will specify the ice cream's flavor. And from a marketing perspective, "milk ice cream" may be more appealing than other options such as "plain ice cream". I am not trying to making a conclusive case it is the best option but just that it is reasonable. And I have had ice cream named "milk ice cream" (or the equivalent in Chinese) several times in Taiwan and mainland China. Years ago when I first I heard of milk ice cream, I assumed the person introducing it to me was confused or meant vanilla ice cream. But I soon discovered that, yet again, what can seem obvious isn't necessarily so obvious. And before I knew it, I was enjoying milk ice cream. Sometimes ice cream with this name may include at least a bit of vanilla flavoring. Nonetheless, ice cream described as having the flavor "milk" is definitely out there. And for those who are now doubting my sanity, Flying Cow Ranch in Miaoli County, Taiwan, offers one clear and definitive case of the existence of "pure" milk ice cream. 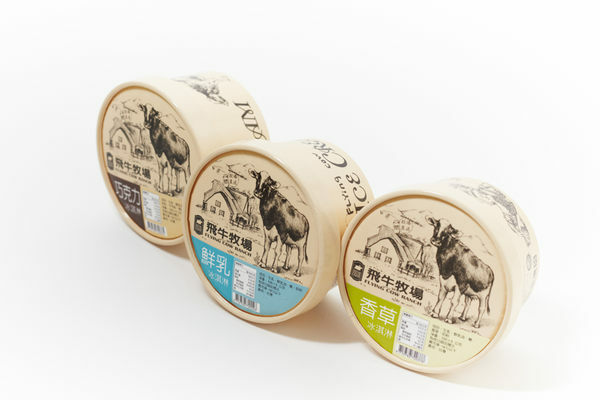 On a Yahoo Taiwan ecommerce site, Flying Cow Ranch's store sells three flavors of ice cream, as seen above, labeled in Chinese as "chocolate", "milk", and "vanilla". The listed ingredients for the milk ice cream are "raw milk, fresh cream, sugar, and milk powder". Although I wouldn't say it was my own personal favorite, I wouldn't question anyone else who declared it as theirs. And without hesitation I would recommend giving it a try if you have the chance. Like Potomaker's colleague, you might find milk to be your new favorite flavor of ice cream. 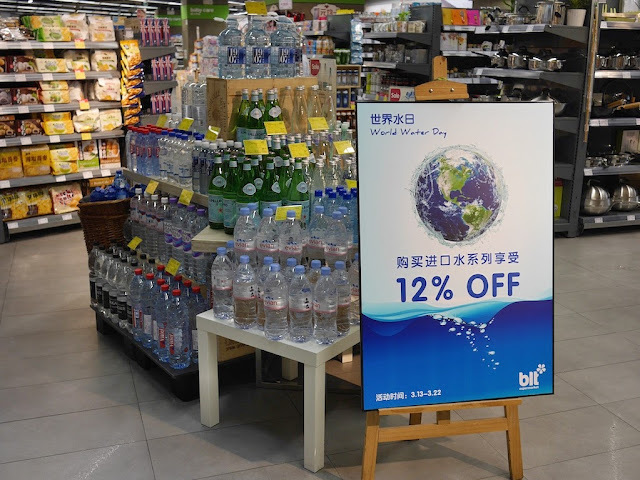 Yesterday at a blt supermarket in Zhongshan, China, I was reminded that today, March 22, is World Water Day. 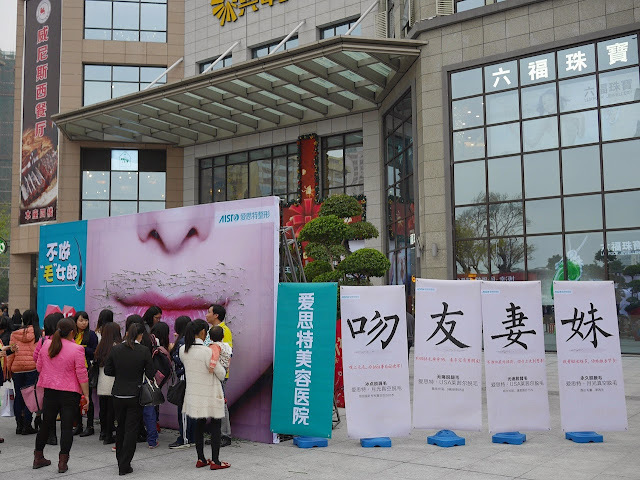 Like a recent promotion in Zhongshan on International Women's Day, I question whether it appropriately reflects the day's spirit. A sale of relatively expensive waters from around the world on a day partly focused on finding ways more people can have access to any sort of safe water doesn't make a whole lot of sense to me. But I guess I shouldn't complain. I visited this particular supermarket specifically due to its unusual-for-Zhongshan selection of carbonated water and saved a few RMB. Although carbonated water is a treat for me here, in Zhongshan I always drink bottled water. I wouldn't feel safe regularly drinking tap water in China. Finding clear and reliable numbers on China's water safety can be challenging. For example, although a 2014 report by the World Health Organization and Unicef indicates China has made notable strides in the number of people with access to improved drinking sources, this is largely based on the assumption that having piped water on premises is better. The report doesn't address whether the tap water in China is actually safe. 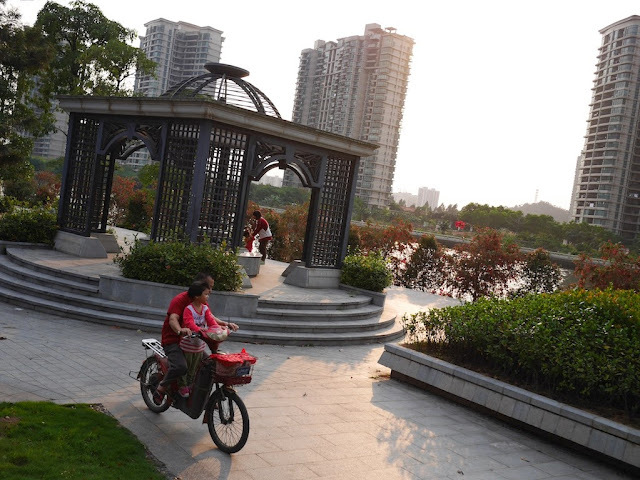 Even by China's own standards, though, much of its water is bad. Incidents of severe water contamination are obviously not positive signs and some experts are highly suspicious of tap water. Other experts argue that China's approach to improving water access and water quality largely through a "infrastructure-focused approach" is misguided and should instead "focus on cleaning water sources and recycling water". When I wonder about the reliability of the bottled water I drink and the amount of tap water I have ingested indirectly through prepared foods, I am not sure how much I have accomplished. One of the things I enjoy during my trips to the U.S. is drinking and using water straight from the tap without worry. This is one respect where I would say most Americans don't appreciate how good they have it. For more about something that is so important yet easy for some to take for granted, see Tariq Khokhar's "5 reasons why water is key to sustainable development" and David Sim's "World Water Day 2015: Photos to make you think twice about wasting this precious resource". 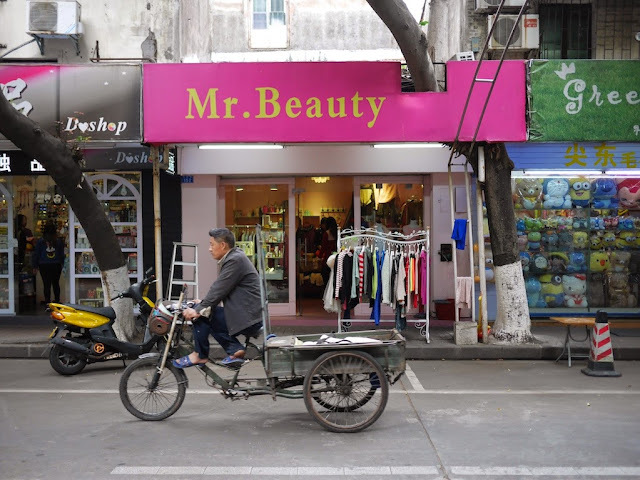 The latter includes a number of striking images from China and elsewhere providing more reason to appreciate regular access to safe water, especially if it as close as the kitchen sink. For many in the northern hemisphere in the West, March 20th marks the first day of spring. For those in China who also associate spring with the March equinox, the same astronomical moment occurs early in the morning on March 21st. 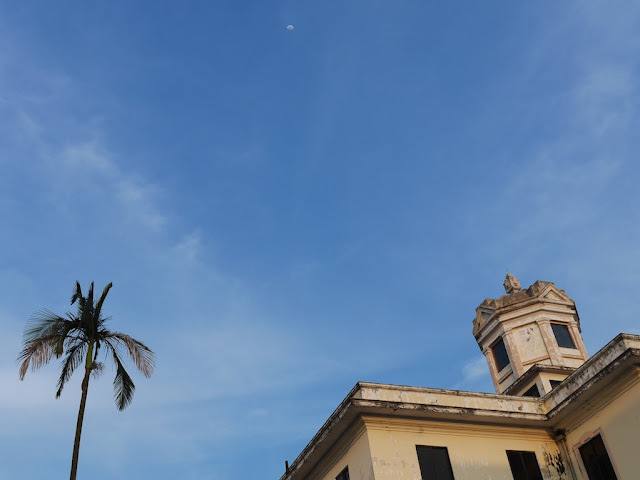 But Zhongshan is far south, roughly similar in latitude to Havana, Cuba (which matches up even better with Zhongshan's neighbor to the north, Guangzhou). So it really doesn't experience much of what I would call winter. 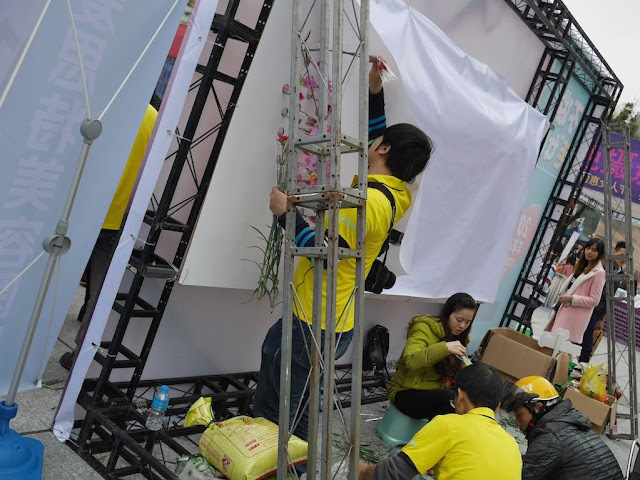 Combined with the fact that in China spring would be traditionally said to have begun on the arrival last month of the new Year of the Yang, there is plenty of reason to say spring was already here. 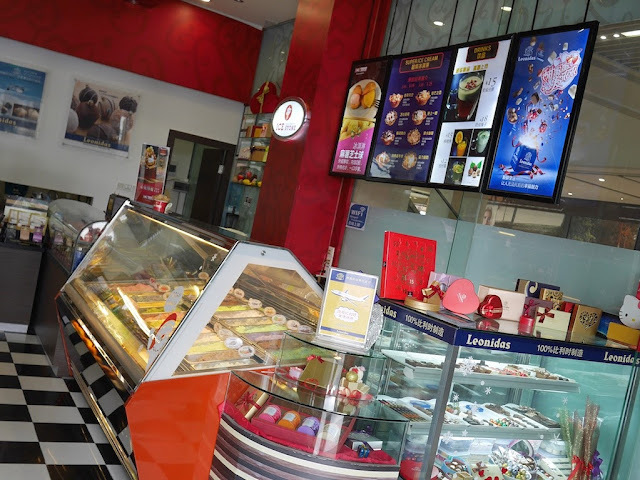 U.S.-based Cold Stone Creamery opened its first mainland China ice cream store near People's Square in Shanghai in 2007. 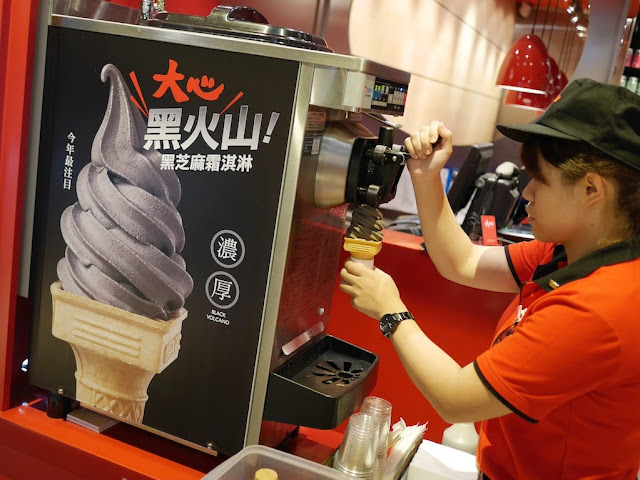 Many more Cold Stone stores have since opened elsewhere in Shanghai and also Beijing, Hangzhou, Nanjing, Shenzhen, Suzhou, Tianjin, and Wuxi. 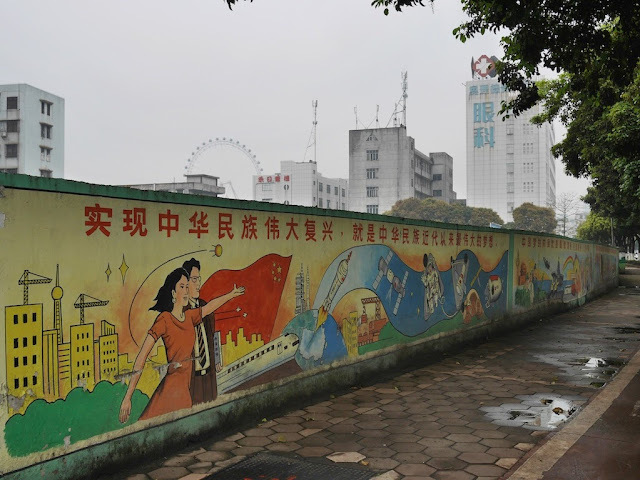 Recently during a walk, I was surprised to see their reach had spread to Zhongshan, Guangdong province, as well. The first time I briefly saw the store, though, something seemed off. When I passed by another time, it hit me. Despite the outside resemblance, the store wasn't actually a Cold Stone Creamery. The ice cream logos for Cold Stone and Ice Stone aren't exactly the same, but, like the names, the resemblance is rather remarkable. I could recognize the difference only after a direct comparison. 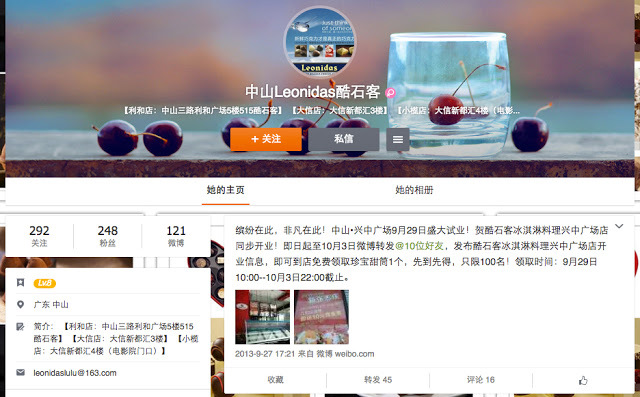 Ice Stone Creamery appears to have an account on Sina Weibo — a Chinese online service roughly equivalent to Facebook and Twitter. Curiously, "Leonidas" takes the place of "Ice Stone Creamery" in its name, although "Ice Stone" can be seen in some posted photos. 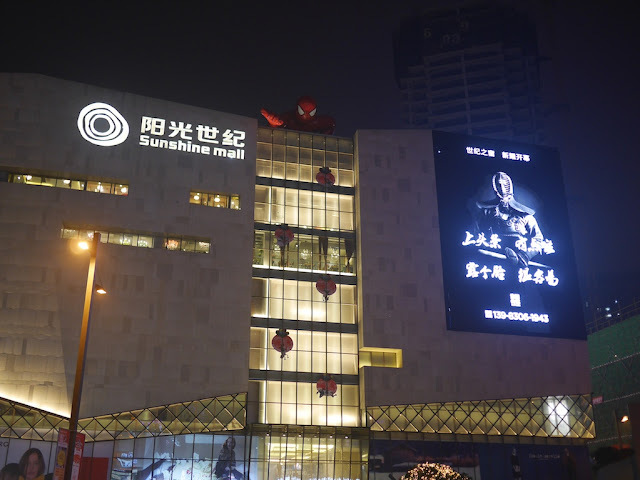 The most recent post, which is from September, 2013, shows a photo of the store I saw before it opened at the Central Power Plaza shopping mall. 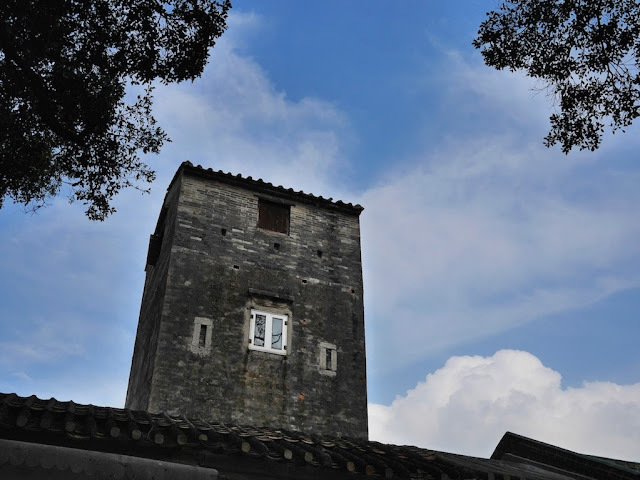 The account also mentions other locations in Zhongshan. After recognizing the store for what it was, I felt compelled to give it a try to see how it compared. In response to my questioning, the server proudly told me they were a local Zhongshan store. They offered a variety of flavors such as cantaloupe, chocolate, coconut, cookie, cranberry, durian, and green tea. For 18 RMB (about U.S. $2.88) I ordered a scoop of mint chocolate chip ice cream. Unlike the Cold Stone Creamery, the chocolate chips were already in the ice cream and other toppings were offered only after the ice cream was in a cup. As I sat down with my ice cream (sans additional toppings), the remarkable placement of a trademark symbol next to the Ice Stone Creamery logo on the cup reminded me of a 7-Eleven lookalike store in Guizhou. But what I was most interested in was the taste of the ice cream, so I quickly dug in. And the taste truly puzzled me. It was difficult to notice any mint flavor and identify what I could taste. A few more not-especially-creamy spoonfuls left me rather disappointed, so I tossed the rest — something I rarely do with ice cream in China (or anywhere). The ice cream was great though! It came with toppings, a waffle cone and all! We will DEFINITELY be going back there again. So perhaps I would have better luck with another flavor or Ice Stone store. Or perhaps Ice Stone hasn't maintained the quality of its ice cream. Or perhaps the person has a very different perspective on ice cream. I don't know. Whatever the case, like with the McDonald's Year of Fortune Burgers, I don't feel especially motivated to give Ice Stone's ice cream a second try. I don't know whether Cold Stone is aware of Ice Stone and whether there is much it has done or can do from a legal perspective. But I do know that I will later have more to share from China about other imitators and, thankfully, better ice cream. 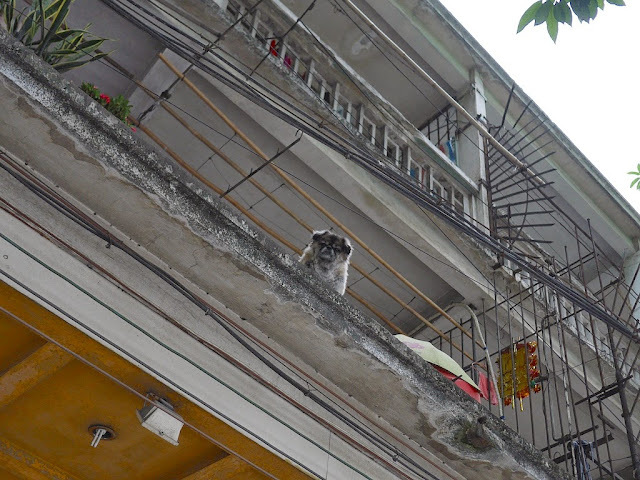 I have seen a number of pet dogs in China. 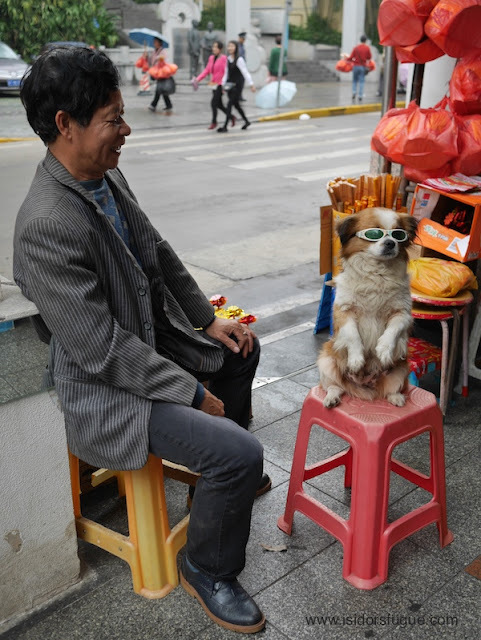 Today in Zhongshan, Guangdong, I met perhaps the coolest of them all. Despite it being five days since the official public holiday, today I saw a remaining indication of International Women's Day in China: a sale at a War Ground store in Zhongshan, Guangdong province. The number 3.8 on the "Happy Women's Day" sign at the store not only represents the date of International Women's Day but also indicates select items have been discounted to 38% of their original price. 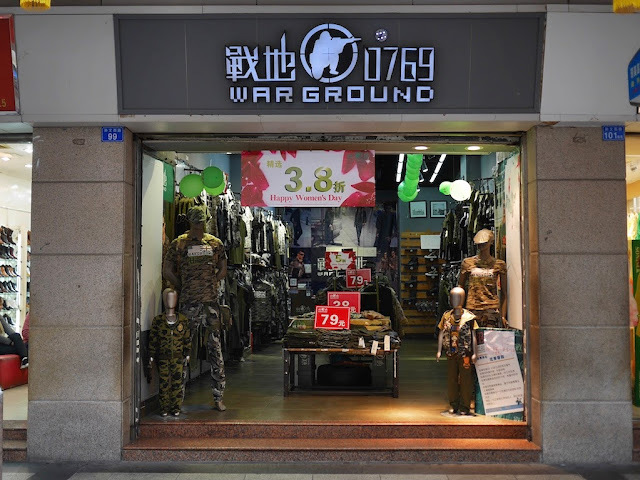 War Ground is based in nearby Dongguan*, and a number of stores sell its military-themed clothing. On prominent display at the store in Zhongshan was a shirt with American and British flags. War Ground's website currently includes a variety of photos that, like some of its clothing, include a Western theme to some degree (for example, here and here). One set appearing in a rotation of images especially caught my attention. As evidenced by the Pabst Blue Ribbon World War II memorial beer I saw in Hengyang, this is not the first time I have seen references to the U.S. role in World War II on commercial products in China. 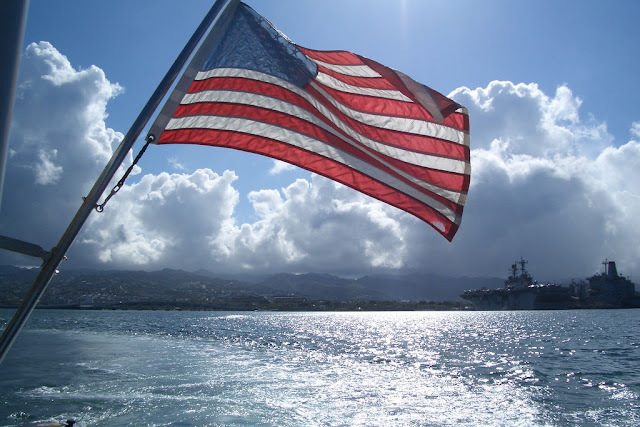 And similar to an image of a U.S. flag in an English-learning mobile app I also saw in Hengyang, one of the images in War Ground's Pearl Harbor set appears to be a cropped version of an image posted elsewhere: in this case a photo taken by Daly Sorvongsavanh posted under an Attribution-NonCommercial-NoDerivatives license. Photo by Daly Sorvongsavanh; See here for original and rights reserved. War Ground's use of the photo doesn't appear to respect any of the license's main conditions**, but it's possible they have received Sorvongsavanh's permission directly. Whatever the case, I doubt the Women's Day sale at War Ground will last much longer. And I would be surprised if they have a sale for China's next official public holiday. *The War Ground website lists 美林(香港)投资发展有限公司 as the owner of the brand and the website. Based on the name, this company appears to be connected with Merrill Lynch Far East Limited in Hong Kong, but I did not find confirmation. **Whether the cropped version of the photo should be considered a violation of "no derivatives" is debatable though. 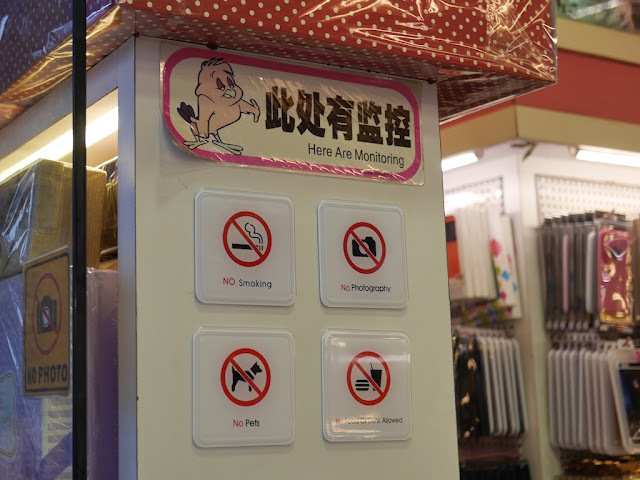 A sign I saw today at a store in Zhongshan, Guangdong, seemed symbolic of a common theme in both China and the U.S.: an expectation to monitor but not be monitored. 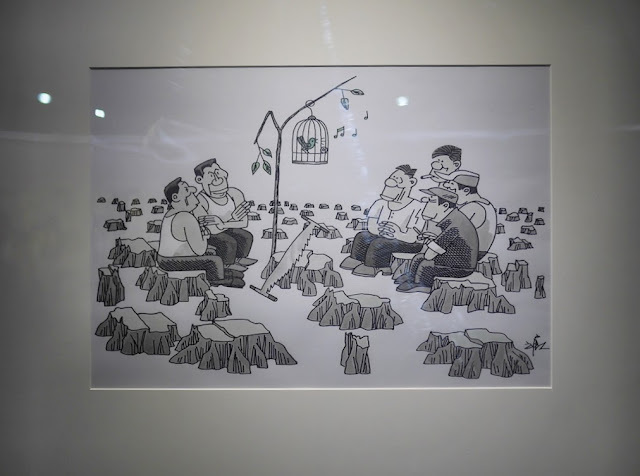 The Zhongshan Cartoon Museum (website in Chinese) opened just over two years ago at scenic Yixian Lake Park in Zhongshan, Guangdong. 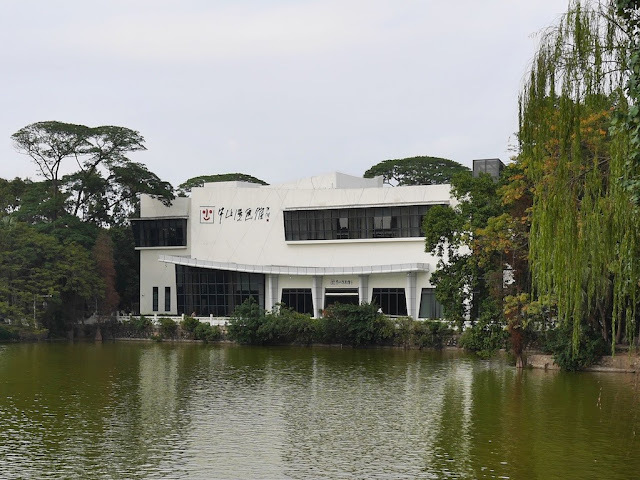 The Chinese characters "漫画" (mànhuà) in the museum's name are translated into English as "cartoon". 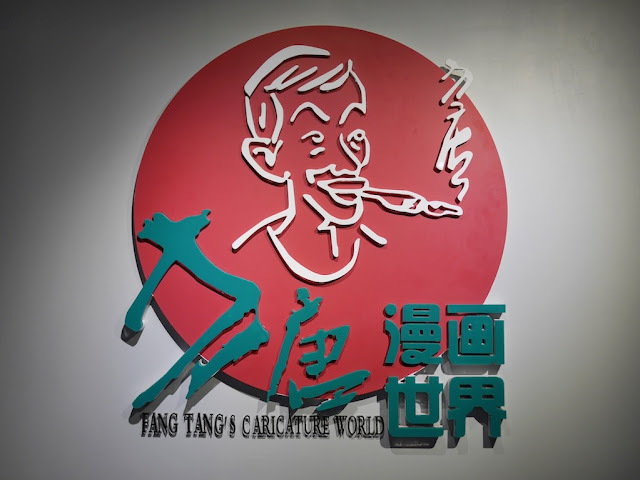 But in a different context on a sign introducing a collection of pieces by Fang Tang (方唐), the characters are translated as "caricature", which captures the spirit of his work displayed there. Fang Tang, formerly known as Chen Shubin, was born in Zhongshan in 1938 and has achieved national recognition (source in Chinese). 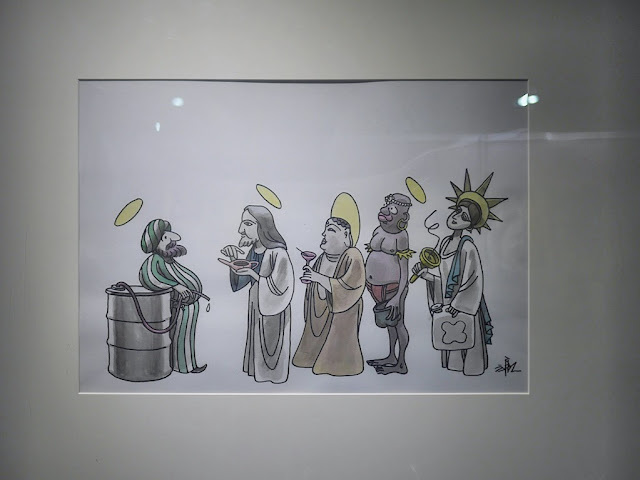 According to the Zhongshan Daily Overseas Edition, Fang donated a number of his pieces to the museum because he felt it was a better option than them becoming "rubbish" after he dies. As a whole, I considered Fang's works to be the most striking examples in the museum, in large part due to the topics they covered. Below are photographs of six examples of his work along with their titles. 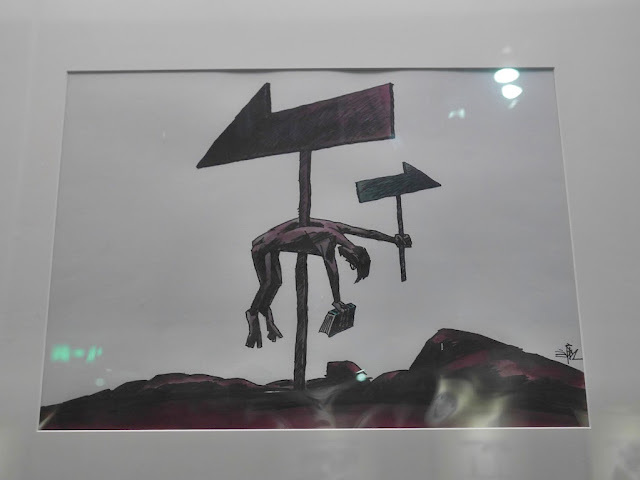 I would typically take a pass on translating artwork titles, especially without consulting the artist. However, for the sake of providing some context, I gave it a shot, erring on the simplistic side. Titles in the original Chinese are included as well, and dates are listed when possible. 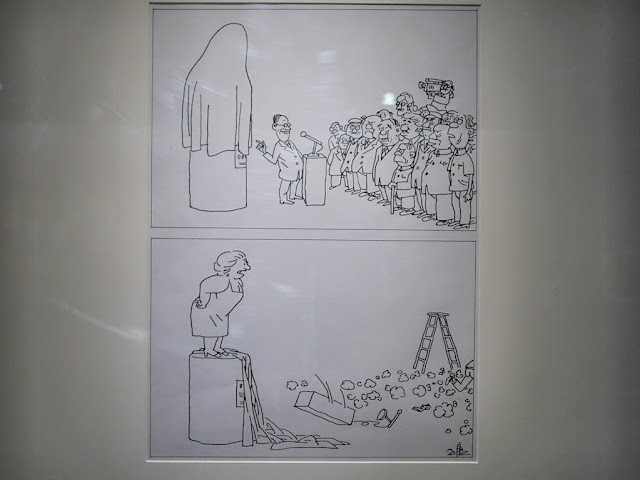 With the exception of "Henpecked Disease", I would not have been surprised to see the below examples as editorial cartoons in an American publication, although a slightly different meaning could have been intended or interpreted in some cases. The pieces provide a taste not only of what Fang wanted to creatively express but also of what he has been allowed to express in China. China detained at least 10 women’s rights activists over the weekend to forestall a nationwide campaign against sexual harassment on public transportation that would overlap with International Women’s Day, according to human rights advocates and associates of the detained activists. . . .
On Friday evening, police officers in Beijing detained Li Tingting, who works under the pseudonym of Li Maizi. Ms. Li has been known in advocacy circles since she started a campaign in 2012 to push officials to build more public toilets for women. She was then a 22-year-old student. Also on Friday, an activist in Guangzhou, Zheng Churan, was detained by the police. The homes of Ms. Li and Ms. Zheng were both searched. The promotion suggested that hair removal could lead to increased kisses or could improve one chances of finding a boyfriend. I guess that was their suggestion for how to "Make It Happen". I didn't notice much else, except that in front of the mall and around the nearby popular pedestrian street, there was an unusually large police presence keeping a close eye on things. As far as I know, nothing happened. Who is not a fan of Looney Tunes? 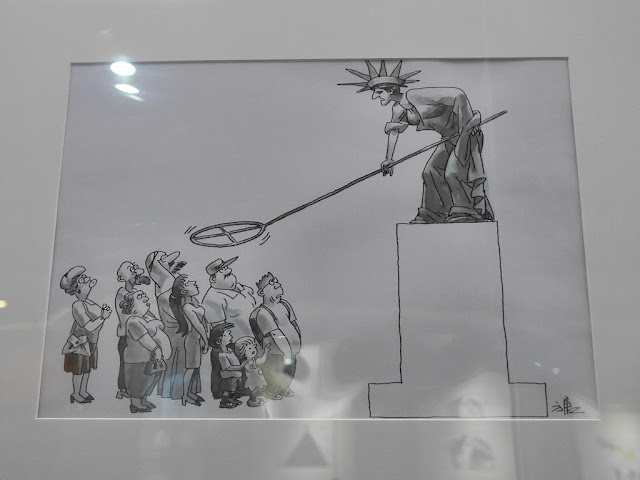 More tomorrow on the topic of cartoons in Zhongshan, China, though these cartoons will have a far more political aim than Looney Tunes. Coincidence? You decide. But I am going to keep looking up. Today I saw something I found especially thought-provoking due to what was being held and where it was being held. 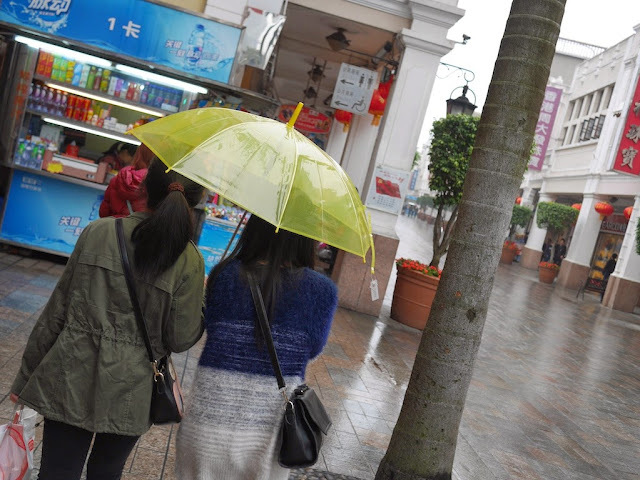 In front of me, two young women walked under a yellow umbrella in Zhongshan, the renamed birthplace of Chinese revolutionary Sun Yat-sen.
At a one point, a passing policeman on a motorcycle noticeably jerked his head to look at them, but he continued down the pedestrian street without turning back. No revolutions are likely now in Zhongshan, whatever yellow umbrellas mean across the river in nearby Hong Kong. In context of news about a state legislator in the U.S. saying "Asian-descent voters should adopt names that are 'easier for Americans to deal with'", I had an online conversation with an American acquaintance about the new names Chinese sometimes choose to use when they come to the U.S. to live, work, or study. I think it could be of interest to readers, so I will share it below. For reasons of privacy, I have changed two names to Mark and Juan, as well as changed some of names I used as examples. Mark: I had a student from China that changed his name because he wanted an "American" name. So he called himself Juan. :) I told him that was a nice name but it wasn't an "American" name. We had a good laugh but he kept it. Mark: It was still funny and we did have a good laugh. Don't forget, he didn't come from a Hispanic background. Me: Juan also didn't come from many other backgrounds which have influenced what names are common in the US. I would agree his name seems atypical for someone coming from China. If I met him, it would catch my attention as well. I suspect the deal here is that for many who come to the US (from wherever) and want a new name, their choice is indirectly or directly impacted by race/ethnicity, not just "Americanness". Your student's choice doesn't fit into how that has often played out, so it stands out to us. I'm curious to know how he chose it. On the note of unusual name choice... In China, I often meet younger people who, at least in my eyes, have chosen rather creative English names. My favorite is "Spoon". As always, feel free to share your thoughts. 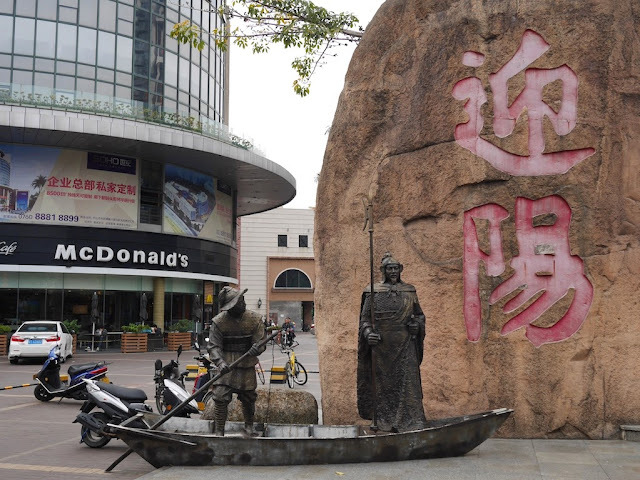 The red traditional Chinese characters "迎陽" (Yíngyáng) are the name for a nearby community. And it didn't look like the boat would be going anywhere soon.